This has to be one of the most unusual situations, but this weekend we treated Charlie for Ethylene Glycol Poisoning. Ethylene Glycol is a product found commonly in anti – freeze solution. It is very common in radiator and brake fluids. The product is usually a bright green colour and is very sweet. When ingested (even tiny amounts), it causes kidney failure. Death can occur within a day or so of ingestion. Initially, pets will look a bit “drunk” or may have some vomiting. This occurs within an hour or so of ingestion. The toxin is then broken down in the liver and form a more deadly kidney toxin. In Australia, the only antidote we have is alcohol. Alcohol alters the chemical reaction and stops the kidney failure from occurring. It is important that we treat these pets as soon as possible after ingestion. For most pets, a couple of licks of anti-freeze is enough to cause problems. How we treated Charlie: Charlie had a tube placed through his nose to his stomach. Over about 48 hours, he was given successive doses of alcohol. The easiest form of alcohol is vodka. In fact for the whole weekend, Charlie had a huge party with us in the Pet ICU. 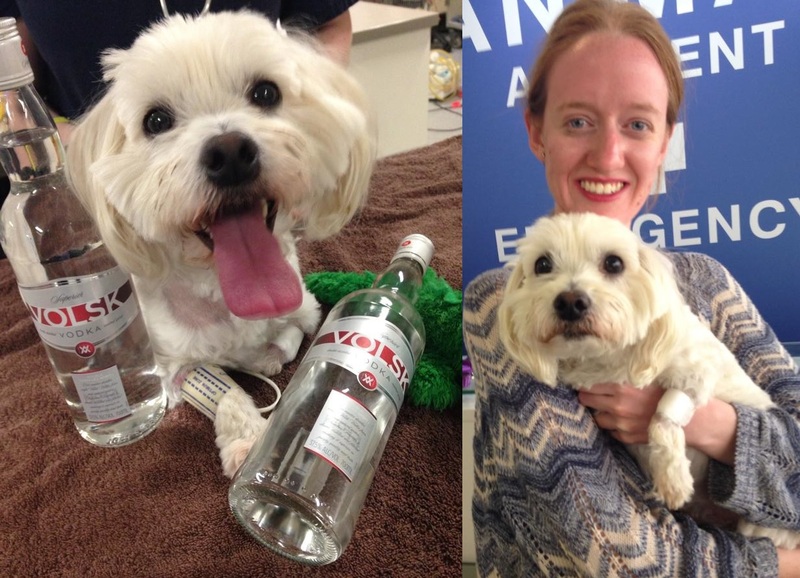 The vodka sedated Charlie and while undergoing therapy, we needed to monitor Charlie in our Intensive Care Unit. The good news is that Charlie has recovered and is not showing signs of kidney failure. Charlie went home this morning, still nursing a hangover. We treat 2 or 3 cases of Ethylene Glycol per year in our 24 hr Pet Emergency Centres.